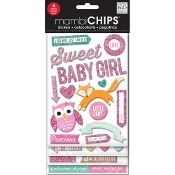 Decorate your paper crafts and other creative projects with cute embellishments like the Me & My Big ideas Chipboard Stickers. These self-adhesive chipboards can be used to add texture and style to handmade crafts, scrapbooks, greeting cards, invites, envelopes, picture collages and more. The value pack comes with 63 pre-cut chipboard stickers in attractive designs and colors on backing sheets.